This collection of transcripts from a 50-year-old educational TV series has its creaky moments, but overall it is surprisingly fresh, containing much sound thinking on a variety of philosophical questions. As if embarrassed to reveal the book's age, the publishers neglect to mention until the afterword that its contents were originally broadcast in 1953 – 54 as a series of 52 weekly half-hour TV shows. 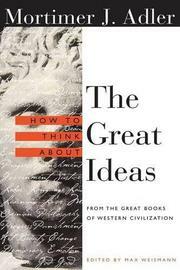 This material has been shaped into 52 chapters on the "Great Ideas": e.g., truth; knowledge and opinion; good and evil; beauty and art; law and government; philosophy; and God. Each idea is rationally investigated, on the assumption that clear thinking can yield some knowledge and sharpen some questions. As a window into television's early days, the book has curiosity value: viewers of the time evidently considered it good television to watch Adler (Art, the Arts, and the Great Ideas, 1994, etc.) discourse on philosophy with his sidekick Lloyd Luckman. Try selling that format to a network today! In some ways the show was forward-looking: viewers interacted with Adler, sending written queries that were answered the following week, like a slow-motion Internet forum. Other touches seem musty: references to President Eisenhower and the burning issue of "conformity versus dissent," and the absence of references to non-Western writings. Much of the content is familiar from Adler's other books, padded with the wordiness endemic to speech. Even so, the encyclopedic scope on issues of genuinely perennial interest is welcome, as is Adler's refreshingly non-postmodern optimism about the power of philosophy to discover truth. Adler, who characterizes philosophy as "rational talk about the basic problems of mankind," is occasionally too talky, but for the most part delivers the rational discourse he promises.